The Galaxy S8 and S8+ are launching in the first few markets, and Google has outed an interesting announcement to coincide with that moment. 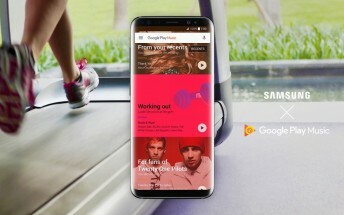 The search giant is letting us know that it's partnered with Samsung to make its Play Music app the default music player and service on the Korean company's Android devices. The first two to benefit from this arrangement are the Galaxy S8 and S8+, of course. This isn't just a matter of being the default app, however, as Play Music has a special feature on Samsung's new flagship smartphones. While usually you can upload 50,000 songs from your collection to the service for easy streaming afterwards, if you have an S8 or S8+ you are able to upload twice that amount - so 100,000 tracks. This will come in especially handy if your musical tastes are of the niche variety and Play Music doesn't have your favorites in its database. But wait, there's more! If you bought a new Samsung phone or tablet, you'll get a free three month trial of the Play Music subscription streaming service. This gives you ad-free and on-demand access to more than 40 million songs and thousands of playlists. You also get access to YouTube Red where that's available. Finally, Google says Play Music will work well with Bixby, Samsung's nascent virtual assistant. If you're a Play Music subscriber you'll be able to ask Bixby to play stuff for you - that is, when Bixby's voice interface will launch for English, because at this point it's still "coming soon".